LA JOLLA, CA—One reason we survive into adulthood is that cell-killing T cells usually recognize and eliminate cancerous or pathogen-infected cells. But prolonged overactivity of immune cells summoned to a tumor or infection site can render them useless to dispatch invaders, a cellular state immunologists call “exhaustion.” Fortunately, cancer researchers are devising effective immunotherapies to counter exhaustion and re-motivate immune cells to eradicate a patient’s tumor. 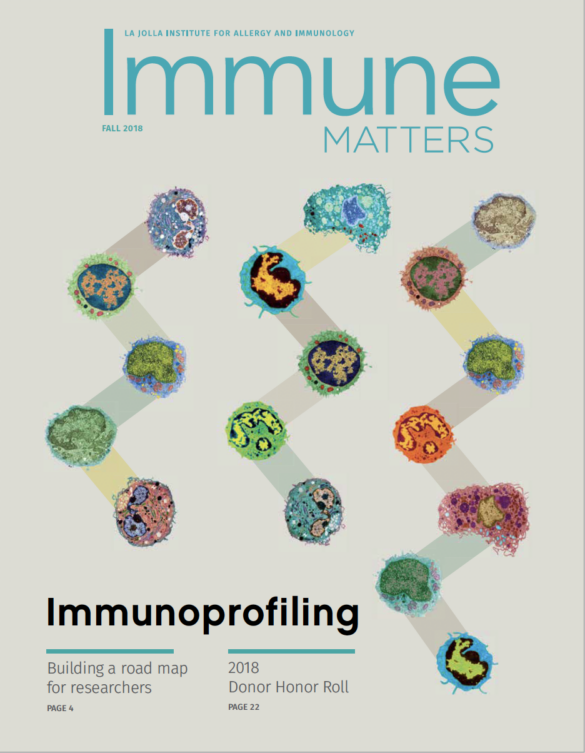 To bolster these approaches, La Jolla Institute for Immunology (LJI) scientists Anjana Rao, Ph.D., and Patrick Hogan, Ph.D., are asking what genes become activated when immune cells flag. Their new study, published in this week’s online issue of Proceedings of the National Academy of Science, reports first that the DNA structure of exhausted T cells differs from that of normal cells. That discovery led them to compile an updated list of candidate DNA binding proteins that may drive exhaustion programs in immune cells. This work provides researchers with additional factors that could be targeted as part of next-generation immunotherapies. 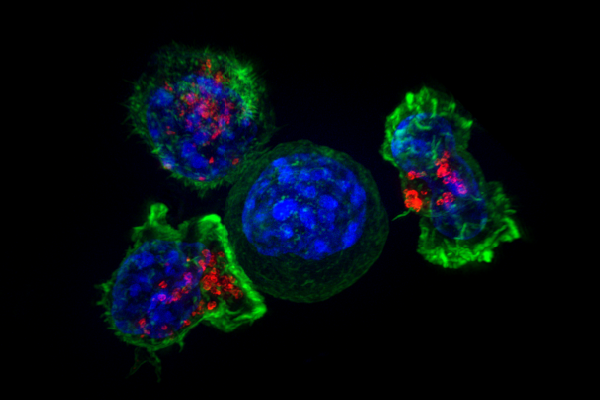 To observe how T cells lose their steam in the tumor environment, the team prepared two populations of genetically engineered T-cells: a test group that recognizes a tumor antigen and thus can be rendered non-functional by chronic exposure to the tumor (the exhaustion group), and a control group that remains functional because it doesn’t recognize any tumor antigen. That readied them to compare what goes awry molecularly inside exhausted compared to fully competent T cells. They did that by injecting the T cells into model mice bearing melanomas to monitor how each test group would behave in a real tumor. Both populations congregated in tumors, but over time cells of the exhaustion group began to display high levels of “exhaustion markers” (as anticipated), because they were overstimulated by the tumor antigen. Among those markers was PD-1, a molecular bad actor notorious for blocking cell-killing capacity of T cells (PD-1 inhibitors, for example, captured headlines two years ago when proven effective against some forms of metastatic melanoma). By contrast, control T cells that the group recovered from a tumor displayed much lower levels of exhaustion markers, simply because they did not perceive the tumor. The next step was to identify genes switched on in the exhausted group and determine how that happened. To do that the team combined two methods, RNA-sequencing and ATAC-sequencing. RNA-sequencing identifies genes switched on, while ATAC-sequencing identifies genomic regions where the DNA helix is more loosely wound relative to the rest of the genome. Finding these regions provides molecular geneticists with major clues about what’s going on in a cell, as non-compacted DNA generally contains genes undergoing active expression and binds factors that activate those genes. ATAC-sequencing revealed almost 2000 newly “accessible” regions in failing T cells, a number the group pared down to 450 after subtracting comparable regions in stimulated control T cells. The group then examined the DNA sequence in “exhaustion-related” stretches and deduced, using bioinformatic analysis, what cellular proteins might be recruited to those loci to activate exhaustion-specific gene expression programs. However, one group of suspects uncovered by the analysis, a family of proteins called Nr4a, had little previous connection with exhaustion in T cells. Further analysis strongly suggested that Nr4a proteins contribute solely to exhaustion, unlike NFAT, which plays a complex, context-dependent role in T cells. The conclusion was clear: DNA binding factors like NFAT and Nr4a proteins likely work in concert to drive T cell dysfunction. One goal of next-gen immunotherapies might be to restore durable immune responses by reversing genomic changes seen in exhausted T cells, possibly by re-compacting DNA that unwinds as T cells become impaired. Whether that’s possible remains unresolved. For example, this paper reports that tumors in melanoma model mice treated with PD-1 blockers shrink as T cell function improves, but that their immune cells showed only minor changes in DNA conformation. In addition to Rao, Hogan, and Mognol, other authors included LJI scientists Sara Trifari, Ph.D. (now at Sorrento Therapeutics in San Diego), Victor Wong, Ph.D., James Scott-Browne, Ph.D., and Susan Togher; and Roberto Spreafico, Ph.D, and Alexander Hoffmann, Ph.D., of UCLA. The study was supported by NIH grants R01 AI109842 and AI40127 (to A.R. and P.G.H.) and AI84167 (to P.G.H.). It was also funded by CNPq, Brazil; the QCB Collaboratory community; a Pediatric Hematology-Oncology Fellowship from UCSD; and the Damon Runyon Cancer Research Foundation.